Some days are filled with surprises and action. Today wasn’t one of those. Today we went to Tesco to get the makings of tonight’s dinner. I fancied making another slow cooker curry, a vegetarian one for a change. That was one of the highlights of the day. Later in the afternoon I went for a walk over St Mo’s. In the sunshine it was lovely and warm, but the wind was decidedly cold, coming from the Baltic the weather fairies say and I believe them. 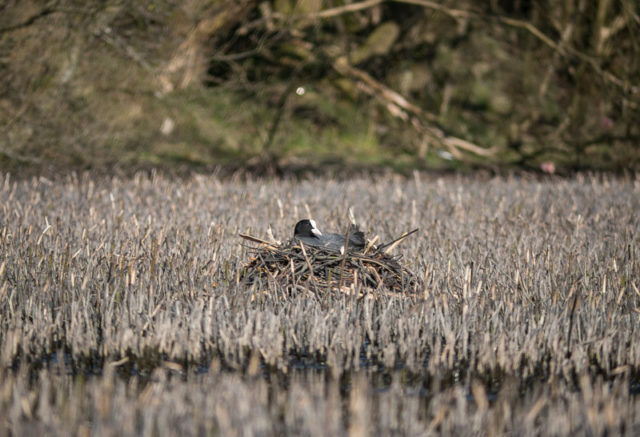 Today’s PoD was another shot of a coot sitting on its nest of twigs on the floating pontoon of horsetails. I walked on down to the BP garage to get some sparkling water to give a lift to the pakora I was planning on making for a starter for the dinner. Found a wee boy, maybe about 12yrs being questioned by a couple of women. He looked completely out of it and to start with I thought he’d been in a fight or had been climbing trees and had fallen, but it turned out he’d had a few sherbets and was just the far side of sober, or so they suspected. He did look a funny colour and they were looking after him and giving him sips of water while his mum was contacted. Me? I’d have been a bit more circumspect about getting involved. These days it’s a minefield being a good Samaritan. In the evening I sorted out the last of the email realignment and I think I now have a fully functioning website on a new server. This week I intend to back up the files from the old server before I clear out the server, and probably also back up the files from the new one too – Belts & Braces. I really can’t thank Hazy enough for the research she’s done for me, not only searching out the best hosting company to go with, but also finding answers and help pages to keep me on the right lines, and then checking that her dad had pressed the right buttons in the right order and not broken anything. Couldn’t have done it without you love. You are a real gem. The curry was a hit and a miss. Scamp didn’t like it, but I did. Such a pity, but the cauliflower pakora was a great hit with Scamp. I wasn’t so keen on it. Like I say, Hit and a Miss. That was about it for today. Went to bed early because I hadn’t been sleeping well these last few days, so the blog was posted on Sunday!